This gorgeous bear is Constantine, a truly spectacular 21" plush bear who you just want to pick up and cuddle! 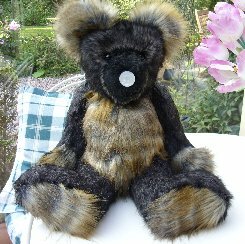 He is made of very soft black plush fur tipped in grey and we have combined this for his body, front and back, pads, paws and ears with much longer plush in shades of grey, brown, fawn and gold. The two look really striking together and are incredibly soft and cuddly. I can't say that I recommend making 21" plush bears in 80+ degree heat, but I think the results were worth it! Constantine is part of our Cornwall Collection, He is filled with plastic pellets and polyester so he has some weight but is still very soft. He has a growler in and a really great white button for his nose. He has shiny black German glass eyes and a very pretty striped wooden belly button. For those of you who like big bears, Constantine could be the one! He costs £95 plus postage. Please note that as with all our bears, Constantine is not a toy and is not suitable for children. Sorry - Constantine has been adopted.